Dorian’s ploy is to swap between the waggler, at the bottom of the far shelf three-quarters of the way over, and the long pole/short-line at the bottom of the near shelf. 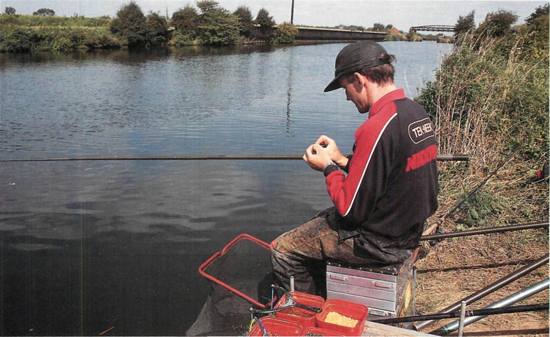 Plumbing up he finds 2m (6½ ft) at the bottom of the near shelf, at 9m, and about the same depth on the waggler line. There’s an awkward facing wind so a heavyish waggler is called for. He picks a home-made insert peacock taking 3AAA+ and shots it. The droppers dot it right down, almost flush with the surface. ‘That’s very important here,’ he says. ‘The fish are educated and the bites can be very shy.’ He sets the rig 15cm (6in) overdepth. ‘You catch mostly on the bottom here, and near the bottom at the end of the drop, rather than up in the water,’ he says. Before baiting with a single bronze maggot he squashes the barb flat with a pair of Styl pincers. ‘If you burst the maggot with the hook, even slightly, the fish won’t look at it, especially the roach,’ he explains. Each cast he feeds his waggler line with about a dozen grains of hemp and half a dozen bronze maggots. The facing wind is getting up and he has to stretch the catapult elastic almost to its limit to get the distance. He also feeds his pole line regularly with half a dozen grains of hemp and half a dozen casters. Dorian punches the waggler out and quickly sinks the line by plunging the rod tip under the surface then flicking it smartly upwards. The float settles, hesitates then slips out of sight. ‘We’re in,’ he says, as his strike connects. The float surfaces with a judder, followed by a shimmer of silver. ‘It’s a small skimmer,’ he says, scooping it out with his landing net. He misses the next few bites, however, and they’re a long time coming. He decides to bulk two of the no.8 shot at half depth. ‘I’m not getting bites on the drop, probably because the water’s cold. And I’m not sure they want this hemp – I think it might be putting them off. Either that or they’re getting preoccupied with it and won’t look at the maggots. I’ve had that happen before.’ He stops feeding hemp on both his waggler and pole lines. Dorian’s living up to his nickname now – he’s bagging with roach and perch. ‘Stopping putting the hemp in has done the trick. It’s a bite a put-in. They’re taking the bait as soon as it hits the bottom.’ Were it not for the facing wind he would really be flying, but he can only feed in between gusts, and it’s upsetting his rhythm. At least it’s warmer now, with the cloud cover starting to break up. His pole has No. 2 elastic through one section, set quite slack. ‘I don’t like it too tight. I like it so that it just creeps back into the pole.’ His float is a 0.65g model with a plastic bristle, teardrop body and wire stem. There is a string of small Styls down to the hook . ‘I prefer to spread them for roach, though when it’s very choppy or towing hard you need all the weights in the bottom half of the rig, with a bulk at half depth.’ Like the waggler, the rig is set 15cm (6in) overdepth. Dorian buries the fine-wire 20 in a dark and crispy caster and pushes the rig out. The float slowly rights itself as the Styls register until only the upright, orange needle of the bristle remains visible. Suddenly it slides away, and a thin tongue of elastic sticks out as he strikes firmly upwards into a small roach. He’s enjoying himself far too much on the float, anyway. The sun is out now and it’s pleasantly warm. The wind has died completely, too, so he needn’t sink his line. This makes it much easier to hit the bites. ‘I’ve gone back to my original shotting,’ he says, ‘as I’m getting bites on the drop now. The water must have warmed up a fraction.’ He’s getting mostly roach now, too, of all sizes up to 8oz (230g).